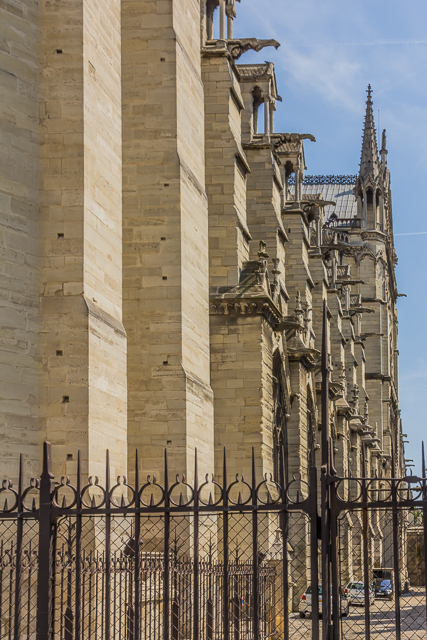 My wife and I spent three weeks in Paris in May of 2014 and during that time we visited Notre Dame twice. The following article is a re-post of an article I first uploaded on August 15, 2014. Later on this week I will post a few more stories and photos from our stay in Paris five years ago. It’s not the prettiest church we’ve seen. It’s the largest in Paris but we have seen many in Europe that are larger. It’s not even the oldest Gothic church around. St Denis is older. 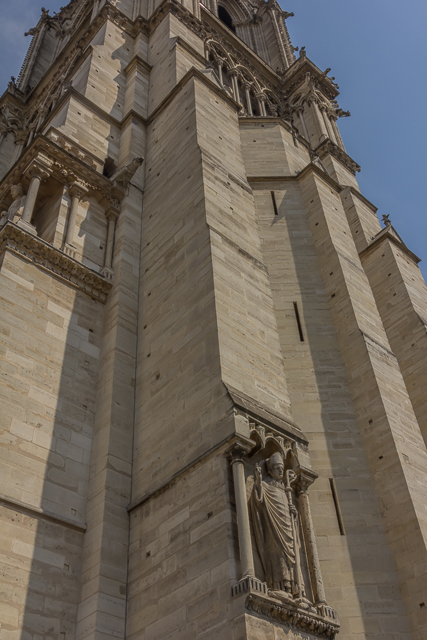 Hey, but it’s Notre Dame and it dominates the east side of Ile de la Cité and can be seen from most of the city. Napoleon was crowned emperor here. Henry IV and Margaret of Valois were married here. So were Mary, Queen of Scots and Francis II. The world’s greatest organ is here. Charles de Gaulle’s funeral was here. And we were here in May of this year. 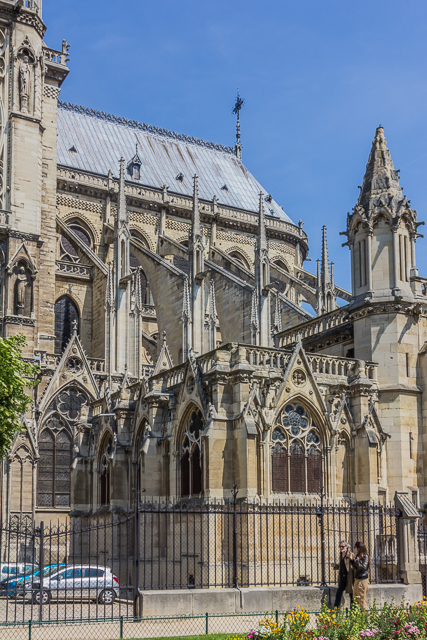 Maurice de Sullly, Bishop of Paris, commenced the construction of Notre Dame in 1163 and the building was completed in 1345. Many modifications were made over several centuries.Then the church was desecrated in 1793 and for the next 50 years or so the building slowly deteriorated from neglect and began to crumble. A major restoration got underway in 1845 and most of the paintings and statues you see today are from the mid-19th century. Another major restoration project began in 1991 and was supposed to last ten years but 20 years later scaffolding could still be seen. But the church was basking in the sun when we saw it for the first time and there was no scafolding in sight. The Last Judgement – central portal of the west facade. Closeup of west facade. 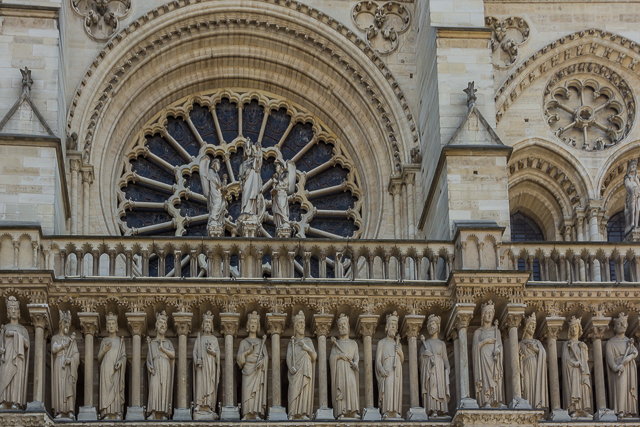 The statues below the rose window, restored in the 19th century, represent the 28 kings of Judah. The revolutionaries in 1793 thought they represented the kings of France and decapitated them. Nearly 200 years later many of the original heads were discovered buried across the Seine. They are now on display in the Cluny Museum. After visiting the church’s interior I decided to walk around the building to get a better look at the famous Gothic architecture. I started walking around the south side of the building and when I got to the northwest corner I encountered a line even longer than the main line in front of the church. I walked to the front of the line and asked the man-in-charge how many steps to the top. “422′” he said (the Internet says it’s only 387) and I thought about it and then thought some more. 20 years ago, surely. 10 years ago, maybe. But today I didn’t think a slightly out-of-shape 74-year-old tourist from California could make it all the way to the top and so I walked on back to where I started my walk (and where my wife was waiting for me). 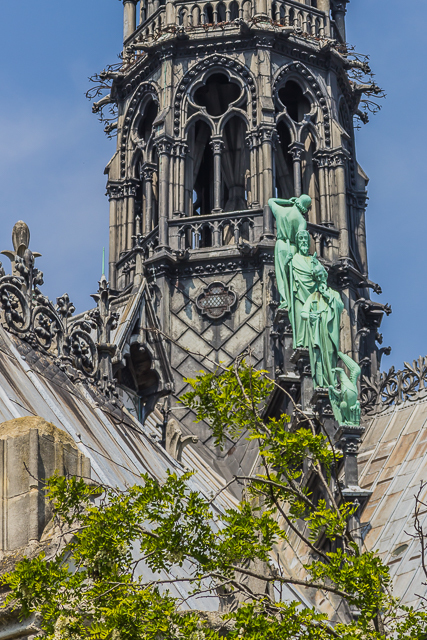 The big bell in the south tower rang all day on August 26, 1944, heralding the liberation of Paris. Looking down the south side of the cathedral from the base of the south tower. East of the south transept. 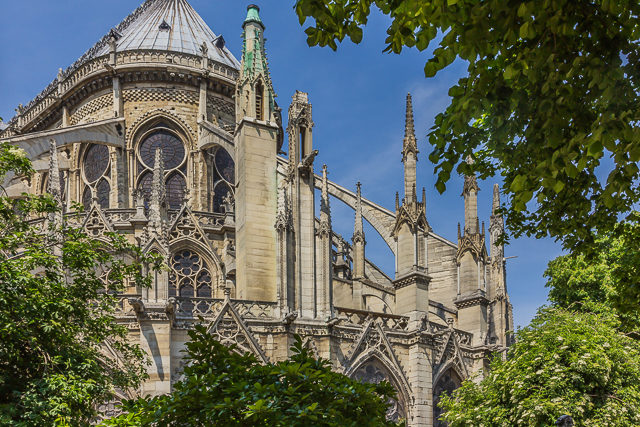 Notre Dame was one of the first churches to employ flying buttresses. 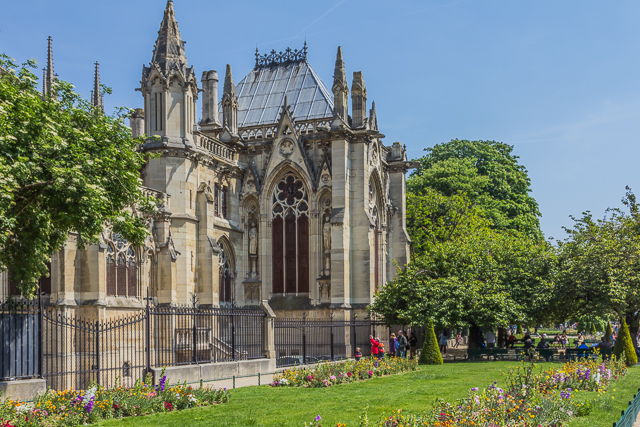 A small park on the south side of Notre Dame. The spire was rebuilt in 1860. The sculpture of the Twelve Apostles continues on the other side. More flying buttresses on the east end of the cathedral. 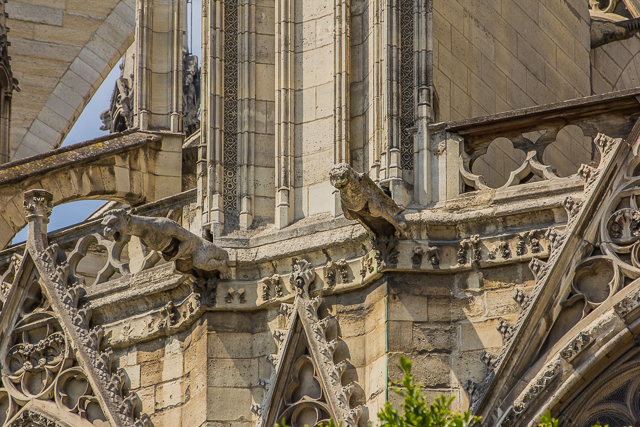 Most of the gargoyles that you see today are from the mid-19th century restoration. 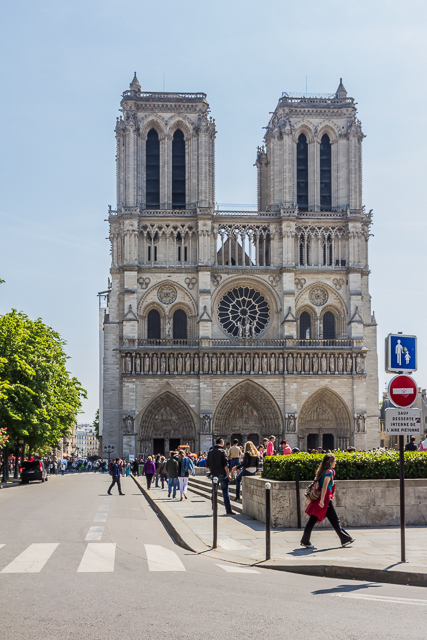 Central Paris is pretty level and conducive to walking and we walked over to Ile de la Cité and passed Notre Dame several times during our three-week stay. A couple of times we stopped by to visit. In my next posting we’ll check out the church’s interior. 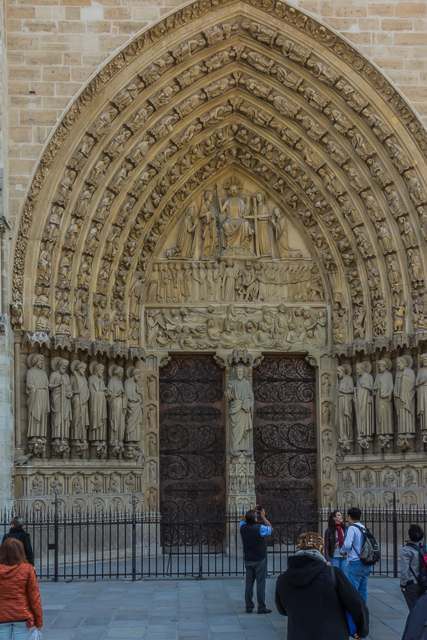 This entry was posted in Architecture, Paris, Travel and tagged architectural photography, church photography, Gothic architecture, Notre Dame de Paris, photography, travel, travel photography. Bookmark the permalink. 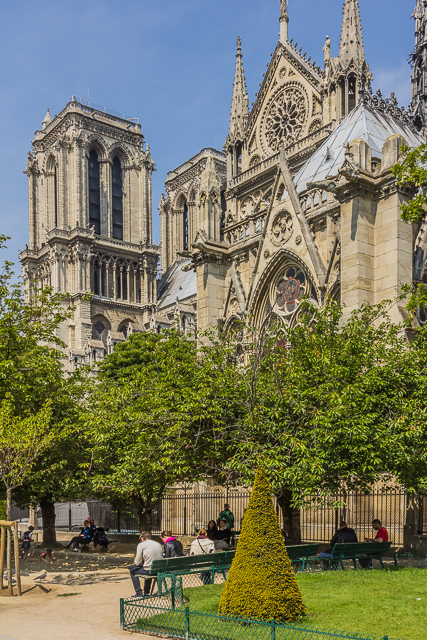 I have never been in Paris, so I appreciate all the more being able to view the Notre Dame cathedral which you captured so well with your camera. Thanks for sharing your impressions with us! This is a beautiful tribute to the Cathedral. I hope they’re able to restore her. It’s been a decade since I have visited it and Paris. I feel blessed to have seen Notre Dame Cathedral.